“That’s not even fair!” asserts Sequoia, a third-grader at Edison Elementary, where it’s pajama day. She’s referring to a hypothetical schoolwide math competition, which moments prior was a hypothetical foot race pitting fifth-graders against kindergartners. The idea is to see if students will apply the same logic to different situations. Her tone suggests that hers is the final word in this debate, but it’s only just begun. The exercise is part of Teaching Children Philosophy, also known as PHIL 399. It’s a collaborative effort between the UO’s Department of Education Studies in the College of Education and the Department of Philosophy in the College of Arts and Sciences in which college students lead weekly philosophical discussions in local classrooms, grades 3-5. 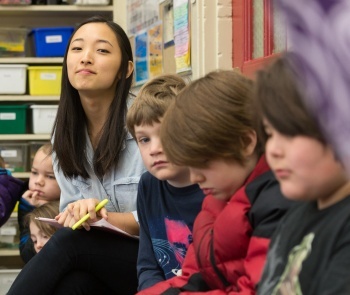 The idea is twofold: Help youngsters understand that effective argument depends on knowledge, not volume, and give UO students some exposure to the complexities of classroom teaching. Call it a learn-learn situation, although it’s sometimes surprising how quickly the grade-schoolers absorb the lessons. Edison is a 90-year-old school just a few blocks south of the UO, where many faculty and staff members send their kids. Most mornings, Principal Tom Horn plays guitar and sings to them as they filter inside, pausing occasionally to issue a high-five. On pajama day it’s hard to tell whether more students or teachers are participating. Morning announcements always include a corny joke. It’s an idyllic setting in many ways, so much so that it’s easy to forget the pressures and frustrations that accompany elementary education in America. Maybe that’s the whole point. Many of the students in PHIL 399 are undergraduates in educational foundations or taking pre-education coursework, as it satisfies a requirement for the major. Paul Bodin, the adjunct professor who has taught the class since 2013, will occasionally jump in or introduce a new scenario, but the classroom largely is the students’. 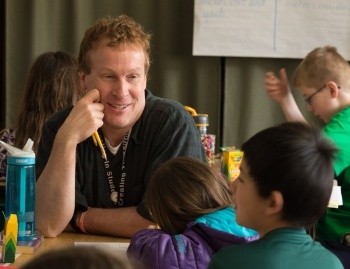 Edison teacher John Benson, who earned bachelor’s and master’s degrees at the UO, opened his classroom to the program, which he said encourages quality, authentic discourse between children. “A classroom atmosphere that fosters an honest give-and-take between students and allows children to share dreams, fears and opinions while respecting and learning from disagreements and conflict is the best way to help students become engaged and contributing members of a community,” he said. “The Teaching Children Philosophy program does just that. The most fascinating thing about watching 8-year-olds bicker politely about philosophical dilemmas — doubly so during an election year — is how consistently respectful they are toward each other. Exuberant group discussions end with a call-and-response measure of claps — from John Fogerty’s “Centerfield” — that signal a transition from talking to listening. Interruptions are rare, as though some invisible token permits only its bearer the privilege of speaking. Comments often begin, “I agree/disagree with ____ because …” From there they might blossom into precocious, well-formed arguments or fizzle into self-contradiction. Occasionally they'll get stuck in a breathless run-on sentence and must be rescued by one of the grown-ups. It’s all valuable, and it’s all okay. Esther Kang is a sophomore pre-ed major from Portland who believes the experience will benefit her career. This week, the scenarios favor issues of social justice and equity, cherished values of the undergraduate and graduate programs in education studies. But next week it might be about hurting someone’s feelings or why we have laws. Not all the topics are interesting to everyone, and it’s during these times that their attention wanders. They tousle each other’s hair, or giggle, or stare longingly out the windows. In time they will realize that these hypothetical scenarios have far trickier analogs in the real world, but for now, life is simple and endless. And that’s okay.